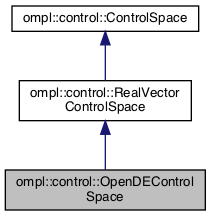 Construct a representation of controls passed to OpenDE. If stateSpace does not cast to an OpenDEStateSpace, an exception is thrown. Get the OpenDE environment this state space corresponds to. Representation of controls applied in OpenDE environments. This is an array of double values. Definition at line 49 of file OpenDEControlSpace.h.